Combine the best of beach and safari when you opt for our combo package deal to Sabi Sabi and Mozambique for an experience of a lifetime. There is no better way to wrap up a holiday of dusty and bumpy safari rides and explosive game viewing than a few days of fun in the surf on the Mozambican coast. Sabi Sabi Earth Lodge has a breathtaking location within the Sabi Sand Private Game Reserve, which is situated adjacent to the world-renowned Kruger National Park, South Africa. This exquisite safari accommodation is a proud bearer of the TripAdvisor Certificate of Excellence and is serviced by a dedicated team that strives to make its guests’ experiences unforgettable. Ingeniously built to blend seamlessly into the landscape and giving the impression that it organically grew from the ground on which it stands, this safari lodge is indeed a real work of art. The candid photos do not do justice to this Kruger accommodation, which will melt every discerning traveler’s heart. Even the hardened of critics cannot fault SabiSabi whose formula of top-notch facilities, excellent service, superb setting, delectable cuisine and thrilling activities are always a winner with all its guests. Not surprising that it receives positive traveler reviews and client feedback on Trip advisor. Immerse yourself in luxury in one of the 13 elegantly appointed suites at Sabi Sabi Earth Lodge and be enchanted by the artistic décor which cleverly incorporates natural elements. Your suite boasts a spacious bedroom, an en-suite bedroom as well as lounge and study areas. Alfresco showers, private plunge pools and personal butlers complete the picture of absolute indulgence. Holiday packages to this stunning lodge can see you cocooned in comfort in the sumptuous Amber Suite which features a tree trunk headboard and an egg-shaped bathtub. Additional amenities include a kitchen, steam room, study, exercise room, full bar as well as a private game viewing vehicle, guide and Shangaan tracker. The communal areas of this safari accommodation include an underground wine cellar, a Zen garden, a boma, spa, art gallery and library. 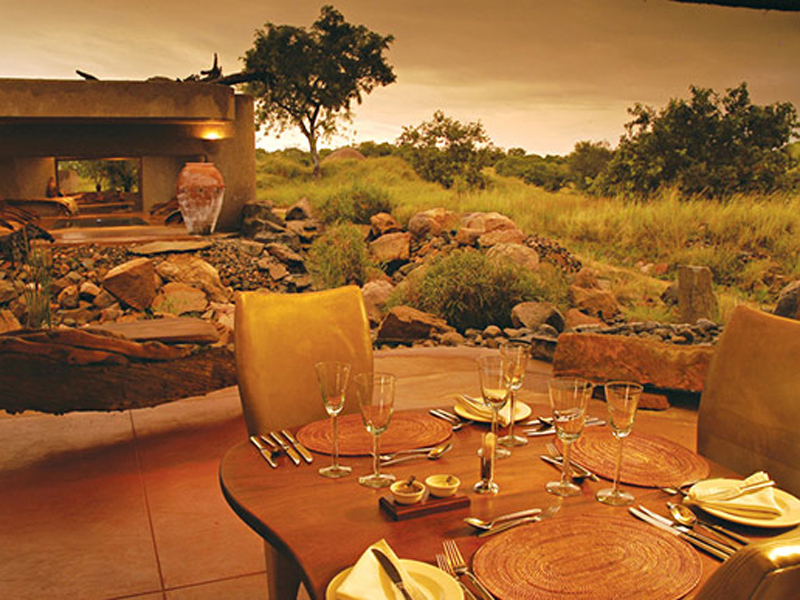 There are indoor and outdoor dining areas with uninterrupted views across the watering hole. Book your holiday combo to Kruger and Mozambique with the specialist tour operator. Contact us to assist you with planning your dream holiday today.